I am a member in the Sons of the American Revolution: Washington State SAR #1700 and have some information to share on Revolutionary War Service in the Southern Colonies. If you would like to do research in this area you may wish to start at the National site which is linked here Sons of the American Revolution National web page. Here are some historic flags used in the War for Independence. Betsy Ross 1776: The circular design was credited to George Washington, Robert Morris and Betsy Ross around 1776. The Congress however did not specify an arrangement for the stars in the canton, as a result there are many variations in the flags that followed until 1912. There is much controversy as to who, what, when regarding the design and credit of this flag, yet it remains one of the most popular "versions" to be displayed and remembered as a flag used in the War for Independence. (THE FLAG'S LEGEND). On 14 June 1777. The Continental Congress resolved, "That the flag of the United States be thirteen stripes alternating red and white; that the Union be thirteen stars, white in a blue field, representing a new constellation". 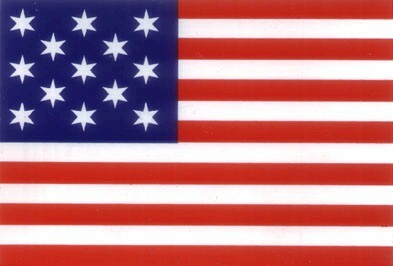 First Official Flag 1777-1795 Official, also known as First Navy Stars and Stripes: Most people believe that the Betsy Ross was the first design, but the first documented U.S.A. flag was the staggered star pattern. This flag was first flown by Captain John Paul Jones on the USS Ranger. On April 24,1778 John Paul Jones, in command of the Ranger, became the first American officer to have the American flag recognized by a foreign power. The original 13 states: CT, DE, GA, MD, MA, NH, NJ, NY, NC, PA, RI, SC, VA. The design of the first Official Stars and Stripes is credited to Francis Hopkinson a popular patriot, a lawyer, a Congressman from New Jersey, a signer of the Declaration of Independence, poet, artist, and distinguished civil servant, had the thirteen stars arranged in a "staggered" pattern technically known as quincuncial because it is based on the repetition of a motif of five units. This arrangement inevitably results in a strongly diagonal effect. In a flag of thirteen stars, this placement produced the unmistakable outline of the crosses of St. George and of St. Andrew, as used together on the British flag. There is no original example of the very first flag still left. 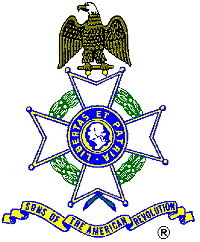 Another version is shown here with a 6 point star design. Researchers continue to debate the exact appearance of our first national flag so both of these designs are presented here for your study. Bedford: This flag was present at the battle of Concord 19 April 1775. It was carried by Nathaniel Page, a Bedford Minuteman. The Latin inscription "Vince Aut Morire" means conquer or die. The arm emerging from the clouds represents the arm of God. The original is housed at the Bedford, MA Town Library. 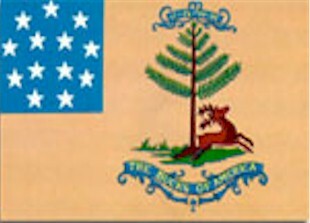 Bennington: This flag flew over the military stores in Bennington, VT on 16 August 1777. The American militia led by General John Stark, defeated a large British raiding force in order to protect military supplies at Bennington. Brandywine Flag: An early interpretation of the "stars and stripes" is found in the canton of the still existing red silk division color carried by Captain Robert Wilson's Company, 7th Pennsylvania Regiment of 1777. The flag is bearing a stars and stripes canton, 7 white stripes and a white canton bearing 13 red eight-pointed stars in rows of 4-5-4. It is said to be a militia unit color used at the Battle of Brandywine. According to family tradition, this flag was carried at Brandywine on September 11, 1777, about three months after the Continental Congress resolution had defined the flag of the United States. British Red Ensign: This flag is one of the best known of the British Maritime flags which were called "Ensigns". This flag is also known as the British Meteor flag, and was widely used on ships during the Colonial period. This was considered the first flag used as the National flag of the United States. The flag was formed by placing the British Union flag in the canton of another flag having a field of white, blue or red. So you might see three variations of this flag. Bucks of America: A regiment of volunteer freemen of color, this was the only document black military unit of the Revolutionary War. 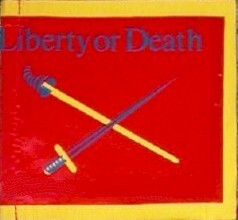 General George Washington and Massachusetts Governor John Hancock presented these regimental colors to the unit. Their initials are part of the design. The original flag is preserved and on display in Boston at the Massachusetts Historical Society. Bunker Hill: On the nights of 16 and 17 June 1775, the Americans fortified Breed's and Bunker Hills which overlooked Boston Harbor. Although they had not officially declared their independence, a fight was brewing. The British advanced up the slope the next day and saw this flag, possibly a red or blue banner. So one might find two variations of this flag. Many early Colonial flags had been made by altering the English flag and most still contained a reference to England. The Colonists still saw themselves as British subjects but were declaring their right to be free from violation of their liberties. Continental: This flag uses a version of the British Red Ensign or Meteor flag with a green pine tree substituted for the British Union flag in the canton. The Continental flag is believed to have been on of the flags carried at the Battle of Bunker Hill. Cowpens: The Cowpens flag was first carried by the Third Maryland Regiment which was part of the Continental line of Maryland, Virginia and Georgia regiments. On 17 January 1781, General Daniel Morgan won a decisive victory against the British at Cowpens, SC. The original flag is stored in the state house in Annapolis, MD. Culpepper Minute Men: This flag represented a group of minutemen from Culpepper, VA. These men formed part of Colonel Patrick Henry's First Virginia Regiment of 1775. In October and November of 1775 three hundred such minutemen, led by Colonel Stevens, assembled at Culpepper Court House and marched toward Williamsburg. Their unusual dress alarmed the people as they marched through the country. The words "liberty or death" were in large white letters on the chests of their hunting shirts. They had bucks' tails in their hats while it is reported that tomahawks and scalping knives were hung in their belts. Easton Flag: The legend attached to this flag is is that it was displayed on 8 July 1776 for the reading of the Declaration of Independence in Easton, Pennsylvania. In reality it is in all likelihood the Company Color of Captain Abraham Horn's Militia Company from Easton raised during the War of 1812. The original survives at the Easton Public Library. First Naval Jack: This flag is believed to have flown aboard the Continental Fleet's flagship Alfred in January, 1776. This flag or one of it's variations was used by American War ships throughout the Revolution. Fort Moultrie: This flag was carried by Colonel William Moultrie's South Carolina Militia on Sullivan Island in Charleston Harbor 28 June 1776. The British were defeated that day which saved the south from British occupation for another two years. Some versions of this flag have the word "LIBERTY" in the crescent moon. The South Carolina state flag still contains the crescent moon from this Revolutionary War flag. Gadsden: This flag was first used by Commodore Esek Hopkins who was the first Commander in Chief of the new Continental Fleet. When his ships put to sea for the first time in February, 1776, flags with the symbol of the rattlesnake were flown. the rattlesnake flags were very popular at time. Colonel Christopher Gadsden of South Carolina copied this flag and presented it to the Continental Congress. Grand Union (Continental Colors): This flag was never officially sanctioned by the Continental Congress but was in use from late 1775 until mid 1777. This flag was an alteration of the British Ensigns or Meteor flag. In its blue canton was the red cross of St. George and the white cross of St. Andrew. The thirteen stripes signified the original colonies. The white stripes were actually sewn on many of the British Ensigns. Retaining the British Union in the canton indicated a continued loyalty, as the Americans saw it, to the constitutional government against which they fought. On 1 January 1776, this flag was first raised on Prospect Hill, which was then called Mount. Pisgah, in Somerville, MA. At this time the Continental army came into formal existence. This flag was known as the continental colors because it represented the entire nation. In one of Washington's letters he referred to it as the Great Union Flag and it is most commonly called the Grand Union today. Green Mountain Boys: On 16 August 1777 the Green Mountain Boys fought under General Stark at the Battle of Bennington. This flag's green field represented their name and the thirteen white stars a tribute to the thirteen colonies. A notable victory of the Green Mountain Boys under Ethan Allen occurred on the morning of 10 May 1775, when they silently invaded the British held Fort Ticonderoga and demanded its surrender "In the name of the great Jehovah and the Continental Congress". The captured cannon and mortars were transported across the snow covered mountains of New England. This surprise installation on the heights over Boston Harbor enabled George Washington to force the British to leave that important harbor. Guilford Courthouse: This flag was raised over the Guilford Courthouse in North Carolina on 15 March 1781. Under the leadership of General Greene, militiamen halted the British advance through the Carolinas and turned them back to the seaport towns. This was one of the bloodiest battles of the Revolutionary War with the British losing over 25% of their troops. 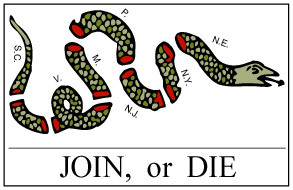 Join or Die: This started off as a political cartoon statement printed in newspapers and handbills. It quickly spread in popularity among some colonists and was adapted to use in some variations of the flags used to defy the British and to unify the colonists. Philadelphia Light Horse Troop: This troop was formed by a group of Philadelphia gentlemen on 17 November 1774. Many were businessmen and merchants who supplied their own uniforms, military equipment and horses. The flag was contributed to the unit by Captain Markoe. It was designed by John Folwell and painted by James Claypoole. The British Union was originally painted in the canton but the artist was instructed to paint thirteen stripes instead, to represent the united colonies. It was this troop of men that escorted General Washington from Philadelphia to take command of the Continental Army which was assembled at Cambridge outside of Boston in June, 1775. The Light Horse Troop later carried their flag in the Battles of Brandywine, Germantown, Princeton and Trenton. Pine Tree: The Pine Tree flag is a generic name for a number of flags used by Massachusetts and by New England colonies from 1686 to 1778. It was officially adopted by the Massachusetts Navy in April 1776. It flew over the floating batteries which sailed down the Charles River to attack the then British held Boston. On 20 October 1775, Colonel Joseph Reed, Washington's military secretary, recommended that this flag be put into general usage so that American ships could recognize one another. Serapis This flag is named for the British ship H.M.S. Serapis that John Paul Jones captured in one of the most famous sea battles of the Revolutionary War. In winning the battle, Jones's own ship the Bon-Homme Richard was so damaged that he was forced to abandon his sinking ship and transfer to the Serapis. It was this flag that flew above the Serapis when it sailed into the Dutch Port of Texel. Sons of Liberty : This was the flag of the early colonist who had joined together in the protest against the British impositions on American economic freedom. One such protest was resistance to the Stamp Act 7 October 1765. A delegate from each of the nine colonies formed the Stamp Act Congress . They petitioned the king and parliament to rescind the Stamp Act. The flag of nine red and white stripes that represented the Sons of Liberty became known as the "Rebellious Stripes." On 16 December 1773, the Sons of Liberty protested the parliament's Tea Act, by "hosting" Boston Tea Party. The colonists' believed the tax to be a violation of their legitimate economic liberty. Three and a half years after the Tea Party the thirteen colonies had come together in their decision to fight for independence and the nine stripes had grown to thirteen. Tauton: This is another example of the colonists' modifying a British flag such as the British Red Ensign. This flag was raised on the Liberty pole in Taunton, MA on 21 October 1774. Sometimes only the word "LIBERTY" was added to the flag. United States-French Alliance: In 1781-1782, in honor of the end of the Revolutionary War and in recognition for the assistance of France in that conflict, a special flag appeared. It consisted of 13 red and white stripes with a very long 11 stripes long, a canton bearing either 12 or 13 white stars and a gold fleur-di-lis. The stars are shown in illustrations as 5 pointed or as 6 pointed in rows of three with a single star below if there are 13 and the fleur at the top. 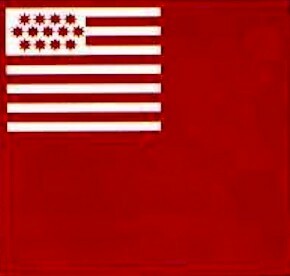 Washington Cruisers: This flag was another variation of the New England Pine Tree flag. The Sons of Liberty would rally under a large tree in Boston which came to be known as "The Liberty Tree". This tree became a symbol of American independence. This flag was used by George Washington on his squadron of six schooners which he outfitted at his own expense in the fall of 1775. Knowing they were up against a great military power, they believed they were sustained by still a greater power, thus their "Appeal to Heaven"
Washington's Headquarters Flag: This flag was used by General George Washington to designate his headquarters. White Plains Flag: This flag was carried by some American fighters on 28 October 1776 at the battle of White Plains, NY where George Washington's Army opposed British General William Howe in what was considered the 4th and final battle for New York.